Prešov was a free royal town, and because of this status Jews were barred from settling here for many centuries. Instead, they lived in the nearby village of Šebeš-Kelemeš (today Ľubotice) and from here commuted to Prešov for business. The first Jew to live legally in Prešov was an influential merchant, Mark Holländer, who managed to settle here despite strong local resistance. It was Holländer who built the Neptune Fountain on the Main Square. In 1830 his son Leo, an ardent advocate of Jewish emancipation in Hungary, became the first president of Prešov's Jewish community. After 1871, the Jewish community split into two separate communities, one Neolog and one Orthodox. On the eve of the Holocaust (1940), some 4,308 Jews lived in Prešov, forming 17.6 % of the entire population. Today the local Jewish community numbers only 55 members. The Orthodox Jewish compound is centered on its magnificent synagogue, whose size and grandeur recall the prosperity of the community it served. The imposing building was constructed by the Košice-based company Kollacsek & Wirth in 1897-1898. Its interior is a real gem: designed in impressive Moorish style with richly colorful decoration, it retains much of its splendor after a painstaking restoration carried out in the 1990s. 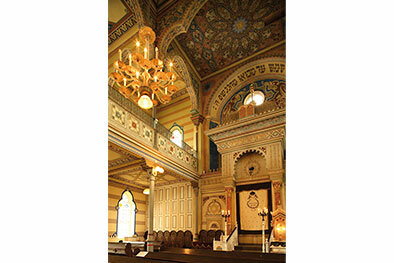 The synagogue is still active as a house of worship, but it also serves as a Jewish museum. The women’s gallery houses the famous Bárkány Collection. This is a priceless collection of Judaica and other objects that was originally assembled by the first Jewish museum in Slovakia, which was established in Prešov in 1928. The collection survived the war and was conserved for decades at the State Jewish Museum in Prague. It was returned to Prešov in 1993, after the Czech Republic and Slovakia became independent states. The Orthodox compound is almost fully intact. In addition to the synagogue, other buildings include the Hassidic Beit Midrash (study house), the school, the rabbinate and the community offices. In the center of the courtyard stands a Holocaust memorial. Other Jewish heritage sites in Prešov include a former Neolog synagogue on Konštantínova Street (now a store) and three Jewish cemeteries.